The goddess Venus tries to restrain her lover Adonis from going off to the hunt. She clings to him, imploring him not to go, but Adonis looks down at her impassively. His dogs strain at their leashes, echoing his impatience, as detailed in the tragic love story found in Ovid's Metamorphoses. Cupid sleeps in the background, a symbol of Adonis's resistance to Venus's entreaties, since his ineffective arrows hang uselessly in a tree. The story ends tragically; during the hunt, the mortal Adonis is fatally gored by a wild boar. Titian's loose, energetic brushstrokes give the painting a sense of spontaneity and movement. In some areas, as in Adonis’s arm, the artist even painted with his finger. The composition's dynamism springs from the torsion caused by Venus's awkward pose, which was inspired by an ancient sculptural relief. Titian used rich colors, shimmering highlights, and a lush landscape to create the painting's evocative, poignant mood. Giovanni Vincenzo Imperiale, 1582 - 1648 (Genoa, Italy), by inheritance to his heirs, 1648. Heirs of Giovanni Vincenzo Imperiale, 1582 - 1648 (Genoa, Italy), sold to Francesco Maria Balbi, 1665. Francesco Maria Balbi, 1619 - 1704 (Genoa, Italy), sold to Christina, queen of Sweden. Christina, queen of Sweden, 1626 - 1689 (Stockholm, Sweden; Rome, Italy), by bequest to Decio Azzolino, 1689. Cardinal Decio Azzolino, 1623 - 1689 (Rome, Italy), by inheritance to Pompeo Azzolino, 1689. Marchese Pompeo Azzolino, died 1696 (Rome, Italy), sold to Livio Odescalchi, 1696. Prince Livio Odescalchi, died 1713 (Rome, Italy), by inheritance to Baldassare Erba Odescalchi, 1713. Baldassare Erba Odescalchi, died 1746 (Rome, Italy), sold to Pierre Crozat, 1721. Philippe II, duc d'Orléans and regent of France, 1674 - 1723 (Paris, France), by inheritance to his son, Louis, 1723. Louis, duc d'Orléans, 1703 - 1752 (Paris, France), by inheritance to his son, Louis-Philippe, 1752. Louis-Philippe, duc d'Orléans, French, 1725 - 1785 (Paris, France), by inheritance to his son, Louis-Philippe-Joseph, 1785. Louis-Philippe-Joseph, duc d'Orléans, French, 1747 - 1793 (Paris, France), sold to Édouard de Walkuers, 1792. Vicomte Édouard de Walkuers, Belgian, 1758 - 1837 (Brussels, Belgium), sold to François-Louis-Joseph de Laborde-Méréville, 1792. François-Louis-Joseph de Laborde-Méréville, 1761 - 1802 (Paris, France; London, England), consigned to Jeremiah Harman, 1793. George Granville Leveson-Gower, first duke of Sutherland, English, 1758 - 1833 and Francis Egerton, third duke of Bridgewater, 1736 - 1803 (London, England) and Frederick Howard, fifth earl of Carlisle, 1748 - 1825 (London, England), upon purchase, Frederick Howard selected this painting as part of his share. Welbore Ellis Agar, second earl of Normanton, 1778 - 1868 (Somerley, Hampshire, England), by inheritance to James Charles Herbert Welbore Ellis Agar, 1868. James Charles Herbert Welbore Ellis Agar, third earl of Normanton, 1818 - 1896 (Somerley, Hampshire, England), by inheritance to Henry Fox, 1896. Henry Fox, first baron Holland, 1705 - 1774 (Somerley, Hampshire, England), by inheritance to Edward John Sidney Christian Welbore Ellis Agar, 1933. Edward John Sidney Christian Welbore Ellis Agar, fifth earl of Normanton, 1910 - 1967 (Somerley, Hampshire, England), by inheritance to Shaun James Christian Welbore Ellis Agar, 1967. H. Shickman Gallery (New York, New York) and Hazlitt, Gooden & Fox, Ltd. (New York, New York; London, England), sold to the J. Paul Getty Museum, 1992. Catalogue of the Orleans' Italian Pictures, Which Will Be Exhibited for Sale by Private Contract, on Wednesday, the 26th of December, 1798, and the Following Days, at the Lyceum in the Strand (London: Sampson Low, 1798), p. 11, no. 224. Couché, Jacques. Galerie du Palais Royal: Gravée d'après les tableaux des differentes ecoles qui la composent avec un abrégé de la vie des peintres & une description historique de chaque tableau. 3 vols. (Paris: Chez J. Couché, 1786-1808), vol. 2 (1808), unpaginated, "XVme tableau de Titien Vecelli.". Buchanan, William. Memoirs of Painting, with a Chronological History of the Importation of Pictures by the Great Masters into England since the French Revolution. 2 vols. (London: R. Ackermann, 1824), vol. 1, p. 114, no. 15. Passavant, Johann David. Kunstreise durch England und Belgien: Nebst einem Bericht über den Bau des Domthurms zu Frankfurt am Main (Frankfurt: Siegmund Schmerber, 1833), p. 277, no. 19 (Verzeichnis der Gemälde aus der Galerie Orleans). Passavant, Johann David. Tour of a German Artist in England: With Notices of Private Galleries, and Remarks on the State of Art. 2 vols. (London: Saunders and Otley, 1836; repr., East Ardsley: EP Publishing Limited, 1978), vol. 2, p. 199, Tizian, no. 19 (Catalogue of the Pictures from the Orleans Gallery). Piot, Eugène. "Sur la Galerie d'Orléans vendue a Londres en 1798: Liste des prix d'adjudication." Le Cabinet de l'amateur et de l'antiquaire 4 (1846), p. 519. Waagen, Gustav Friedrich. Treasures of Art in Great Britian: Being an Account of the Chief Collections of Paintings, Drawings, Sculptures, Illuminated Mss., &c., &c. 3 vols. (London: John Murray, 1854), vol. 2, p. 497, no. 14. Waagen, Gustav Friedrich. Galleries and Cabinets of Art in Great Britain: Being an Account of More than Forty Collections of Paintings, Drawings, Sculptures, Mss. [...] Visited in 1854 and 1856, and Now for the First Time Described, A Supplement to Treasures of Art in Great Britain (London: John Murray, 1857), p. 366. Campori, Giuseppe. Raccolta di cataloghi ed inventarii inediti di quadri, statue, disegni, bronzi, dorerie, smalti, medaglie, avorii, ecc. dal secolo XV al secolo XIX (Modena: Tipografia di Carlo Vincenzi, 1870; repr., Sala Bolognese: Arnaldo Forni Editore, 1975), p. 340 (catalogo dei quadri della regina di Svezia, 1689 circa, Archivio Palatino). Exhibition of Works by the Old Masters, and by Deceased Masters of the British School: Winter Exhibition, Thirteenth Year, exh. cat. (London: Royal Academy of Arts, 1882), p. 32, no. 146. Redford, George. Art Sales: A History of Sales of Pictures and Other Works of Art; With Notices of the Collections Sold, Names of Owners, Titles of Pictures, Prices and Purchasers. 2 vols. (London: Bradbury, Agnew, & Co., 1888), vol. 1, p. 74. Granberg, Olof. Drottning Kristinas tafvelgalleri på Stockholms slott och i Rom, dess uppkomst och dess öden ända till våra dagar (Stockholm: Ivar Hæggströms boktryckeri, 1896), p. 93, no. 115 (app. 2, Marquis du Fresne, "Inventaire des raritéz qui sont dans le cabinet des antiquitez de la sérénissime reine de Suède, fait l'an 1652," Kongl. Biblioteket, Stockholm); p. 118, no. 17 (app. 3, "Inventarium öfver drottning Kristinas tafvelgalleri i Rom, troligen upprättadt strax efter hennes död1689," Archivio Palatino, Rome); p. 159, no. 58 (app. 4, "Inventarium öfver drottning Kristinas forna tafvelgalleri i Rom, upprättadt vid samlingens försäljande till hertigen[-regenten] af Orléans och dateradt Rom 14 Jan. 1721," British Museum, London). Granberg, Olof. La Galerie de tableaux de la reine Christine de Suède ayant appartenu auparavant à l'empereur Rodolphe II, plus tard aux ducs d'Orléans. Pomian Hajdukiewicz, trans. (Stockholm: Ivar Haeggström, 1897), p. 35, no. 30; p. lvi, no. 17 (app. 3, "Inventaire de la galerie de tableaux de la reine Christine a Rome, probablement fait en 1689, peu après la mort de la reine," Archivio Palatino, Rome); p. xcvii, no. 58 (app. 4, "Inventaire de la galerie de tableaux de la reine Christine a Rome, fait en 1721," British Museum, London). Granberg, Olof. Kejsar Rudolf II:s konstkammare och dess svenska öden och om uppkomsten af Drottning Kristinas tafvelgalleri i Rom och des skingrande: nya forskningar (Stockholm: Gustaf Lindströms Boktryckeri, 1902), pp. 36, 107, no. 44. Roldit, Max. "The Collection of Pictures of the Earl of Normanton at Somerley, Hampshire: Article III, Works by Painters of Foreign Schools." Burlington Magazine 4, no. 10 (January 1904), pp. 16-17, ill.
Stryienski, Casimir. La Galerie du Régent Philippe, duc d'Orléans (Paris: Goupil & Cie, Éditeurs-Imprimeurs, 1913), pp. 23, 46, 151, no 40. Gould, Cecil. National Gallery Catalogues: The Sixteenth-Century Venetian School (London: National Gallery, 1959), p. 100, under no. 34. Waterhouse, Ellis. "Queen Christina's Italian Pictures in England." In Queen Christina of Sweden: Documents and Studies. Magnus von Platen, ed. (Stockholm: Kungl. Boktryckeriet P. A. Norstedt & Söner, 1966), p. 374, no. 60. Wethey, Harold E. The Paintings of Titian. Vol. 3, The Mythological and Historical Paintings (London: Phaidon, 1975), pp. 60, 191-92, 275, no. 42, fig. 190. Russell, Francis. "The Hanging and Display of Pictures, 1700-1850." The Fashioning and Functioning of the British Country House. Studies in the History of Art 25. Gervase Jackson-Stops et al., eds. (Washington, D. C.: National Gallery of Art, with University Press of New England, 1989), p. 152. Christie, Manson & Woods, Ltd., London. Important and Fine Old Master Pictures. December 13, 1991, pp. 134-35, lot 85, ill.
Beddington, Charles. "Old Master Successes at Christie's." Christie's International Magazine 8, no. 10 (Spring 1992), pp. 18-19, ill.
Fage, Gilles, ed. Le siècle de Titien: L'âge d'or de la peinture à Venise, exh. cat. (Paris: Grand Palais, 1993), p. 673, under no. 256, entry by Francesco Valcanover. Sayer, Michael. The Disintegration of a Heritage: Country Houses and Their Collections, 1979-1992. Hugh Massingberd, ed. (Norwich: Michael Russell, 1993), p. 151, pl. 7. "Acquisitions/1992." The J. Paul Getty Museum Journal 21 (1993), p. 117, no. 22. Borsellino, Enzo. "Cristina di Svezia collezionista." Ricerche di storia dell'arte 54 (1994), p. 12. Birkmaier, Ulrich, Arie Wallert, and Andrea Rothe. "Technical Examinations of Titian's 'Venus and Adonis': A Note on Early Italian Oil Painting Technique." In Historical Painting Techniques, Materials, and Studio Practice. Preprints of a Symposium, University of Leiden, the Netherlands, 26-29 June 1995. Arie Wallert, Erma Hermens, and Marja Peek, eds. (Los Angeles: Getty Conservation Institute, 1995), pp. 117-26, fig. 5, pl. 26. Fredericksen, Burton B., et al. Masterpieces of Painting in the J. Paul Getty Museum. 3rd ed. (Malibu: J. Paul Getty Museum, 1995), unpaginated, no. 11, ill., entry by David Jaffé. Rearick, William R. "Titian's Later Mythologies." Artibus et historiae 17, no. 33 (1996), pp. 24, 27, 32-35, 41, 43-45, 53, 57, 64n39, 65n61, figs. 3, 16. Fredericksen, Burton B., et al. Masterpieces of the J. Paul Getty Museum: Paintings (Los Angeles: J. Paul Getty Museum, 1997), pp. 32-33, no. 15, ill., entry by David Jaffé. Jaffé, David. Summary Catalogue of European Paintings in the J. Paul Getty Museum (Los Angeles: J. Paul Getty Museum, 1997), p. 125, ill.
Goffen, Rona. Titian's Women (New Haven and London: Yale University Press, 1997), pp. 248-50, 314n110, fig. 147. Russell, Francis. "Venus and Adonis." Christie's Magazine (July-August 1998), pp. 38-39. Sutherland, Bruce D. "A Subtle Allusion in Titian's 'Venus and Adonis' Paintings." Venezia Cinquecento: Studi di storia dell'arte e della cultura 9, no. 17 (January-June 1999), pp. 37, 40, 46, fig. 2. Rico, Lourdes. "Pigmenti del XVI secolo tra Venezia e la Spagna: Tiziano, l'Escorial e il commercio con Venezia." Kermes: La rivista del restauro 13, no. 37 (January-April 2000), pp. 58-71, figs. 1-5. The J. Paul Getty Museum Handbook of the Collections. 6th ed. (Los Angeles: J. Paul Getty Museum, 2001), p. 103, ill.
Allen, Denise, et al. Masterpieces of Painting in the J. Paul Getty Museum. Rev. ed. (Los Angeles: J. Paul Getty Museum, with Thames & Hudson, 2003), pp. 32-33, no. 14, ill., entry by David Jaffé. Danesi Squarzina, Silvia. "La collezione di Cristina di Svezia: Appendice documentaria." In Cristina di Svezia: Le collezioni reali, exh. cat. Ulf Cederlöf and Susanna Le Pera Buranelli, eds. (Rome: Fondazione Memmo, with Mondadori Electa S.p.A., 2003), p. 73, no. 43 ("nota de quadri della Regina Cristina di Svetia," around 1703, inventory of paintings acquired by Livio Odescalchi). Cederlöf, Ulf, and Susanna Le Pera Buranelli, eds. Cristina di Svezia: Le collezioni reali, exh. cat. (Rome: Fondazione Memmo, with Mondadori Electa S.p.A., 2003), pp. 164-65, under no. 49, entry by Lorenza Mochi Onori. Boccardo, Piero, ed. L'Età di Rubens: Dimore, committenti e collezionisti genovesi, exh. cat. (Genoa: Palazzo Ducale, with Skira Editore, 2004), pp. 312-13, no. 71, ill., provenance by Piero Boccardo, entry by Massimo Palazzi. Rosand, David. "Inventing Mythologies: The Painter's Poetry." In The Cambridge Companion to Titian. Patricia Meilman, ed. (Cambridge: Cambridge University Press, 2004), pp. 43, 292n24. Boccardo, Piero. "Gio. Vincenzo Imperiale (1582-1648)." In L'Età di Rubens: Dimore, committenti e collezionisti genovesi, exh. cat. Piero Boccardo, ed. (Genoa: Palazzo Ducale, with Skira Editore, 2004), pp. 280, 284, no. 161 (inventory of paintings at the house of Giovanni Vincenzo Imperiale in Genoa, before 1648). Ilchman, Frederick, et al., eds. Titian, Tintoretto, Veronese: Rivals in Renaissance Venice, exh. cat. (Boston: Museum of Fine Arts, with MFA Publications, 2009), pp. 186, 189, 191-92, 294, no. 33, ill., entry by David Rosand. Panja, Shormishtha. "Titian's Poesie and Shakespeare's Pictures." In Word, Image, Text: Studies in Literary and Visual Culture. Shormishtha Panja et al., eds. (New Delhi: Orient Blackswan, 2009), pp. 26-27, fig. 5. Ziskin, Rochelle. Sheltering Art: Collecting and Social Identity in Early Eighteenth-Century Paris (University Park: Pennsylvania State University Press, 2012), pp. 130, 302n40. Falomir, Miguel, and Paul Joannides. "Dánae y Venus y Adonis: Origen y evolución." 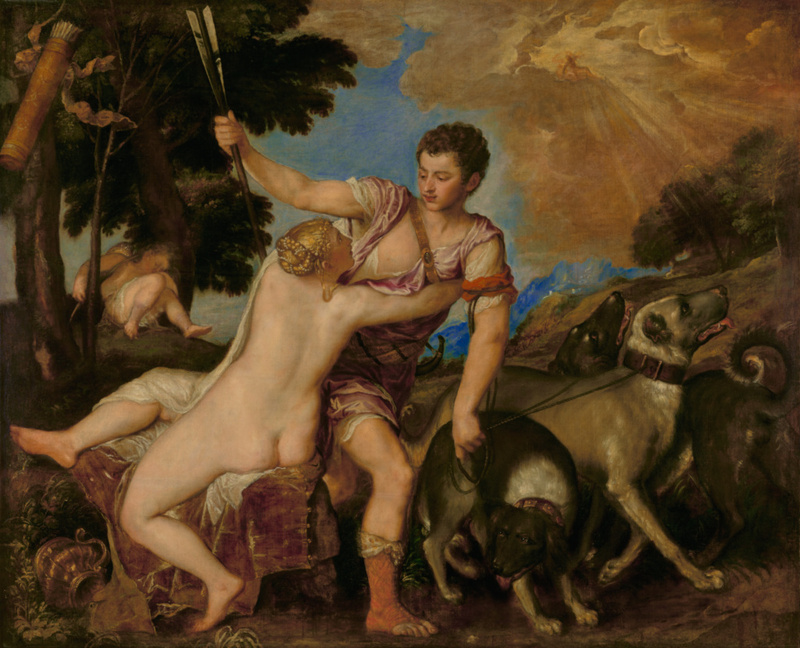 Dánae y Venus y Adonis, las primeras 'poesías' de Tiziano para Felipe II, Boletín del Museo del Prado Número Extraordinario. Miguel Falomir, ed. (Madrid: Museo del Prado, 2014), pp. 34, 46, 47, fig. 48. Falomir, Miguel, and Paul Joannides. "Danaë and Venus and Adonis: Origin and Development." Dánae y Venus y Adonis, las primeras 'poesías' de Tiziano para Felipe II, Boletín del Museo del Prado Número Extraordinario. Miguel Falomir, ed. (Madrid: Museo del Prado, 2014), pp. 67, 70. Padilla, Carmella, and Barbara Anderson, eds. A Red Like No Other, exh. cat. (New York: Skira Rizzoli, 2015), pp. 185, 312, ill.
Turner, Jane Shoaf, and Paul Joannides. “Titian’s Rockeby 'Venus and Adonis' and the Role of Working Templates within his Development of the Theme.” Studi Tizianeschi, no. 9 (2016), pp. 48-70, fig. 20. Sander, Jochen. “Rubens and Elsheimer.” In Rubens: The Power of Transformation, exh. cat. Gerlinde Gruber et al., eds. (Munich: Kunsthistorisches Museum, with Hirmer, 2017), p. 66. Büttner, Nils. “Mirror Images and Naked Bodies: Cats. 102 to 115.” In Rubens: The Power of Transformation, exh. cat. Gerlinde Gruber et al., eds. (Munich: Kunsthistorisches Museum, with Hirmer, 2017), pp. 249-52, no. 102, ill.
Schmid, Vanessa I., ed. The Orléans Collection, exh. cat. (New Orleans: New Orleans Museum of Art, with Giles, 2018), p. 251, fig. 12.26. Looking at Narrative Art Lesson 1: What Are Stories? Students discover how visual artists represent a story by depicting a single moment from it.